Sample preparation is beyond any doubt the most demanding and at the same time the most challenging step of the analytical procedure, thus affecting the final performance of the whole analytical process in the analytical laboratory. Due to its utmost importance it has a great impact on the characterization of an analytical methodology as “green”. Fig. 1. Microextraction steps in MEPS. Sample pretreatment actually involves several sub-steps and consumes not only time and labor, but a huge amount of organic solvents as well. It also leads to increased waste to the environment. 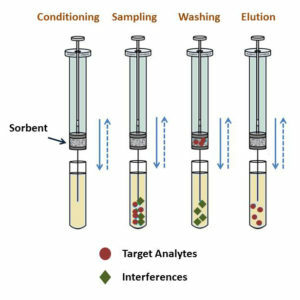 In that aspect the elimination of the sample treatment steps, as well as the application of solvent less approaches can be the basis for greening sample preparation and analytical methods. 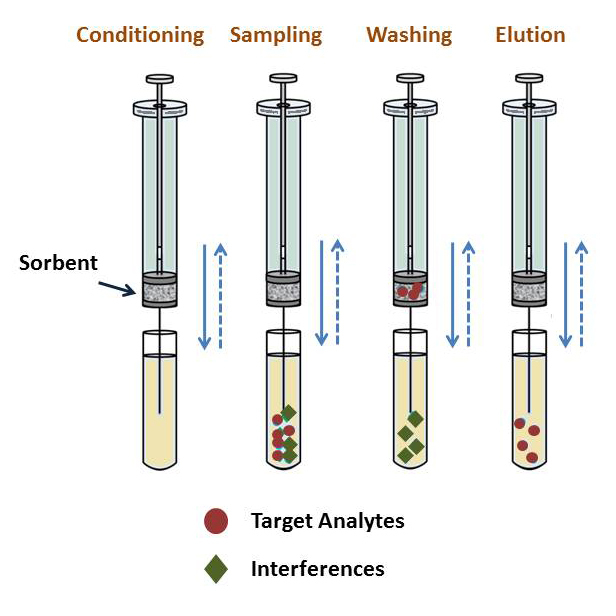 However this crucial step in chemical analysis should be able to ensure quantitative recovery of target analytes, while reducing endogenous matrix interferences during the measurement step. A green approach is considered as environmentally friendly and relies on the concept of sustainable development. Green chemistry concerns atom economy, energy efficiency and it is focused on the design of chemical products and procedures that minimize the use and generation of hazardous substances. The principles of Green Chemistry were introduced by P. Anastas and J. Warner in 1998. Two years later Jacek Namieśnik proposed the application of green chemistry perspective to the Analytical Chemistry field and thus Green Analytical Chemistry emerged handing over the baton to the analytical chemists in order to combine environment-friendly, miniaturized and automated sample preparation methodologies with highly sophisticated analytical instrumentation. In the last two decades several extraction techniques are introduced to replace the prevailing old fashioned approaches like Liquid liquid extraction (LLE), which consumed hundreds of milliliters hazardous reagents causing environmental problems, difficulty in coupling with the analytical equipment, or limited selectivity. Solid phase extraction (SPE) was the leader, requiring only a few millilters. However greener microextraction approaches followed with great success. Solid-phase microextraction (SPME) developed by Pawliszyn and his coworkers in the 1990s was the first approach that was introduced as solvent-less extraction technique. Yet an almost endless list of microextraction techniques is already available. This includes: Microextraction in Packed Syringe (MEPS, as shown in Figure 1), Liquid phase microextraction (LPME), Single drop microextraction (SDME) dispersive liquid liquid microextraction (DLLME), hollow fiber supported Liquid phase microextraction (HFLPME), three phase LPME, Fabric phase sorptive extraction (FPSE), Stir bar sorptive extraction (SBSE), micro Solid Phase Extraction (μSPE), Quick, Easy, Cheap, Effective, Rugged and Safe extraction (QuEChERS), dispersive solid phase extraction (dSPE), magnetic solid phase extraction (MSPE), matrix solid phase dispersion (MSPD), disposable pipette extraction (DPX) etc. All these environment-friendly sample preparation techniques comply with the green analytical chemistry principles and have numerous applications in complex bioanalytical samples (such as saliva, blood, plasma, serum, urine, hair, nails, cerebrospinal fluid, etc), food samples (milk, fish, muscle tissue, vegetables, fruits etc), environmental analysis (soil, sewage, sediments etc), forensics (ink dating, anti-doping etc), and almost in any analytical case. Low concentration of target analytes and the compatibility with the sophisticated instrumentation demanding for clean samples are key factors for the analytical chemist to make the right choice. In conclusion, green microextraction alternative approaches have several advantages over traditional techniques including the use of lower volumes of hazardous solvents and minimal sample number and size, the reduction of the sample treatment steps, with no sacrifice of clean-up efficiency, selectivity, accuracy or precision performance of analytical method. Moreover they ensure the safety of both operator and the environment. Their improvement as well as the future perspectives for green microextraction techniques depends on the development of nanotechnology with regards to the fabrication of new sorbent materials, the use of even less toxic solvents (like ionic liquids), further miniaturization, full automation and on-line coupling capability with analytical instruments. Green approaches in sample preparation of bioanalytical samples prior to chromatographic analysis.